Kris and Brooke are one of those couples that radiate positive energy and energetic vibes. From the moment I arrived in San Francisco, I knew in my bones that it was going to be a trip to remember. From exploring the eclectic neighborhoods that make up San Francisco, to eating way too much, every moment with them was made up of real moments. I first met Kris and Brooke here in Tampa, where they asked me to take pictures of them in their Channelside home to remember their happy memories in Tampa before their big move out to the West Coast. 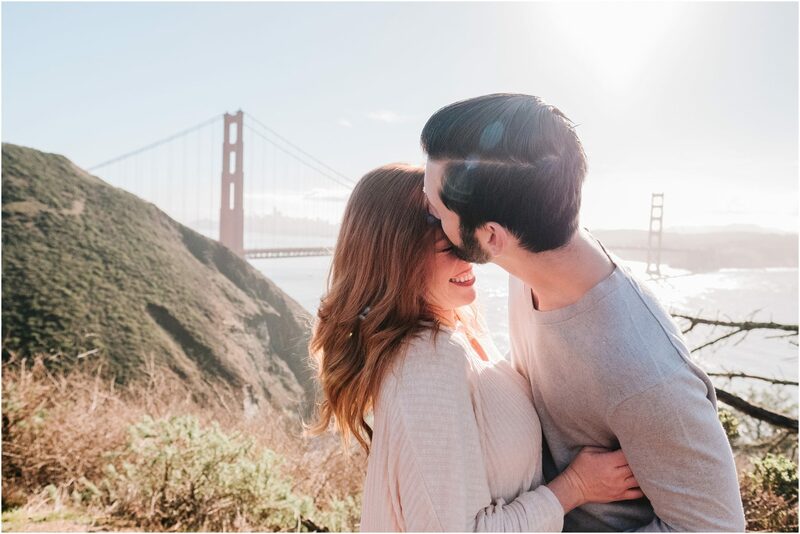 Even though at that time they weren’t engaged, Kris let me in on the secret that he would be proposing during an upcoming road trip they were taking and that at the beginning of the year he wanted me to come out to their new home to capture their real engagement photos. I eagerly followed them on instagram and watched every moment of their road trip from Arizona, through different cities along the way to their new home. It was at the Ritz Carlton in Half Moon Bay, California that Kris finally got down on one knee. Brooke was taking a polaroid photo of the ocean crashing against the rocks, and when she turned around Kris was there with a gorgeous ring and a big smile. Fast forward three days, and I was there! We started off our adventure with a trip over the Golden Gate bridge and hiked to a secluded spot to take some warm up photos. It was the first nice day of the entire trip, like Mother Nature knew we were going to be taking photos that day and she blessed us with some magical golden morning light! From there we drove over to Muir Woods Beach Overlook and took in the AMAZING scenery. I watched as they piggy backed, danced, and stood in silence taking in each other and the beautiful moment. This was their new home, and together we were discovering all of the beauty it held and I could feel the happiness they shared in that moment. After the beach stop, we hopped back in the car and drove another couple hours to Point Reyes. Through interesting small coastal towns, we sang along to Styx, The Beach Boys, and Fleetwood Mac, and ate snacks we picked up earlier that day. We talked about life, and love, and most importantly- their upcoming wedding! Once we arrived at Point Reyes, we were greeted by gorgeous fields, towering trees, and abandoned buildings from the 1920’s. After the long drive back home to San Francisco, we decided to call it a day and ordered sushi and burgers to be delivered to their home as we binge watched a couple episodes of Black Mirror, and then headed out to a local bar for pickle back shots and played some intense rounds of PacMan! The next day we woke up early, grabbed some breakfast, and headed over to the famous Balmy Alley to take in the influential street art and finish off our engagement session with some art inspired shots.